Just in time for boating season and summer vacations, dive watches were a particular highlight at this year’s Baselworld. 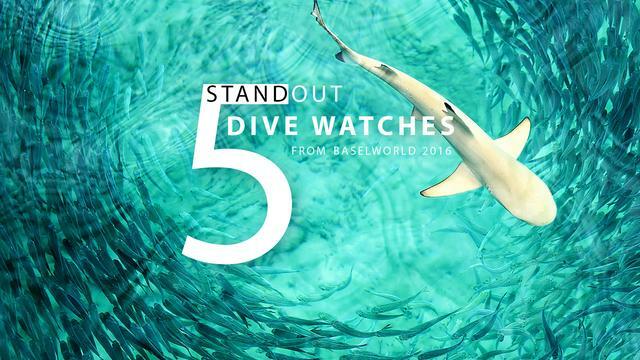 Here, iW has compiled five standout dive timepieces from the show. Read on for more on Omega, Alpina, Oris, Hamilton and Tudor. The Omega Seamaster Planet Ocean 600M Co-Axial Master Chronometer is a part of the Planet Ocean collection that celebrates ocean exploration. One of the most legitimate facets of the piece is the helium escape valve, a decompression system, which allows helium to escape from the inside when the watch is worn for professional use in pressure chambers. The 43.5 millimeter steel case It is also available as a GMT or a chronograph. The watch will be available in stores in July 2016. 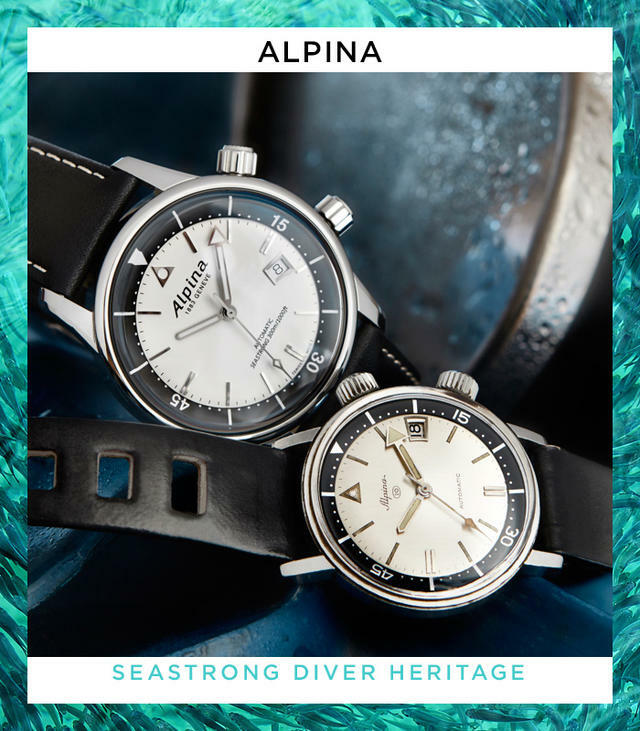 Echoing a 1960s Alpina dive watch, this is the vintage version of the equally impressive Seastrong Diver 300 Automatic, another 2016 Alpina debut. But instead of that latter model’s single crown, this Heritage version utilizes two crowns, one for winding and adjusting the hands, the other for adjusting the internal diving time rotating ring in both directions. The design, issued with two vintage dial styles, makes for both a safe and thinner dive watch. With a more modern 42 millimeter steel case, the watch’s engraved, screwed caseback resists water pressure to 300 meters. Oris always offers more than few well-priced, professional-grade dive models. But as Oris’ first bronze watch, and a handsome one at that, the Carl Brashear Limited Edition gets my nod for my ‘best of’ list. Bronze is initially bright and shiny, but the case and the unidirectional rotating bezel of this retro-themed watch will gradually darken a bit over time. The automatic watch is a commemorative model that pays tribute to Carl Brashear, the U.S. Navy’s first African-American master diver. The watch owes its design in part to the look of deep-sea diving helmets from the 1950s. The 2,000-piece limited edition is water-resistant to a depth of 100 meters and is fitted with Oris Cal. 733, based on Sellita SW200, with date at 6 o’clock. The watch arrives in a nicely made wooden box with U.S. Navy Master Diver badge on the inside of the cover. What do rubber, titanium, portholes and blockbuster movies have in common? All are elements of the exciting 2016 relaunch of the Hamilton Khaki Navy Frogman watch. This revival is a tribute to a piece of real and onscreen diving history: the iconic submersible watch created for the US naval frogmen teams and featured in the 1951 movie The Frogmen and the brand’s very first on-screen appearance. This first appearance in the film industry, in which the company has become a leader, has its roots in military reputation that dates back to World War I and II when Hamilton, founded in 1892, equipped the U.S. military. In keeping with its double billing as a super-sporty watch and stylish accessory, the 2016 standout 46 millimeter titanium model is clearly built to meet the high demands of its underwater vocation. Large surfaces ensure easy readability and high-tech specs include an edgy, red unidirectional rotating bezel. The latter frames a black dial with luminescent triple-facetted hands. The red-trimmed tip of the seconds hand highlights its role as an operating indicator and a vital feature of diver’s model. Tudor’s Heritage Black Bay Dark is new addition to the Heritage Black Bay family, this diver’s watch in matt black steel draws its characteristic elements from Tudor’s history. It inherits the general lines, as well as the domed dial and crystal from the first Tudor diving watches. It features the particularly prominent winding crown from the famous 7924 reference of 1958, aka the “Big Crown”, while its characteristic angular hands, known as “snowflake”, were borrowed from TUDOR watches used by the French National Navy in the 1970s. The 41 millimeter wide steel case, finished with a black PVD-treated coating. The watch has an entirely satin finished matte finish, giving it the appearance of black military equipment. It’s powered by the MT5602 Manufacture Movement.